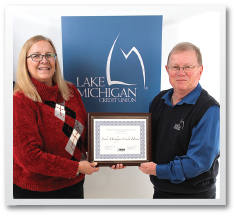 Michigan State Housing Development Authority’s (MSHDA) Top Lender award is given annually to its top ten mortgage lending institutions. LMCU ranked #7 on this list for 2014. Additionally, LMCU loan originator, Matt Adler, was ranked #3 in the state of Michigan for the same time frame, based on loan production. Kudos to our outstanding mortgage department!